What is Colorado Rapid Avalanche Deployment (C-RAD)? 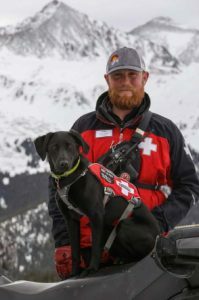 As a growing 501(c)3 organization with over seventy members, C-RAD exists to cultivate, inspire, and produce dog teams for successful avalanche search and rescue in the mountains of Colorado. These volunteer teams combine traditional search and rescue methods with specialized avalanche deployment systems to expedite rescue of avalanche victims. We are a volunteer group who work our day jobs as ski patrollers, guides, and in other outdoor professions, and do this in addition to those jobs. Though a live find has not been had from an avalanche in North America, the closure that finding a victim brings to the family is immeasurable. The first Colorado avalanche rescue dogs started training in Summit County in the mid-1980s. But the real catalyst for the creation of Colorado Rapid Avalanche Deployment was the devastating Peak 7 avalanche outside the Breckenridge Ski Area boundary in 1987. Eight people were caught in the massive slide, and four people without avalanche transceivers were buried and killed. The search and rescue operation took three days and required hundreds of rescue professionals and volunteers painstakingly probing into feet of avalanche debris to find the victims. Realizing the need for coordinated, county-wide avalanche response with trained dogs, the Summit County Sheriff, Summit County Search and Rescue Group, and Flight for Life helicopter service began to lay the groundwork for what would eventually become the robust statewide C-RAD program we have today.